Active Optical Cable is a category of interconnect used in telecommunication networks and data centers such as Direct Attach Cable (DAC) and Optical Transceiver. What is an Active Optical Cable ? An AOC is two transceivers attached together by a fiber cable, creating a one part assembly. Like, DAC, Active Optical Cable can not be separated. However, AOC do not use copper cables but fiber cables allowing them to reach longer distances. Active Optical Cables can reach distances from 3 meters up to 100 meters, but they are commonly used for distance up to 30 meters. 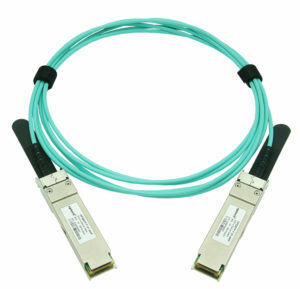 The AOC technology has been developed for several data rate from 10G SFP+ to 100G QSFP28. 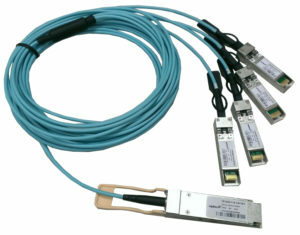 More recently, several companies have been working on the development of the 400G QSFP-DD Active Optical Cable. What are the advantages of AOC ? Active Optical Cable can reach longer distance than DAC, up to 100 meters depending on the data rate and the type of fiber cable used. They are lighter and smaller than DAC, but they are more expensive, which is one of their main drawback. Unlike DAC, AOCs are immune to EMI (electromagnetic interference). Active Optical Cables are comparable to using transceivers and separated cables in terms of performance. One of the advantages of AOC compared to using optical transceivers is that there is less maintenance work. Indeed, there is no need of assembling and cleaning the connectors. AOC is a cheaper interconnect solution and also decreases the operating costs by consuming less power. How the Active Optical Cables are used? Active Optical Cables are mostly used to connect switches, servers and storage between different racks inside a data center for example. AOCs are also used to link devices inside a same rack, but usually for distance below 3 meters, the use of DAC is preferred. For AOC products, the length and type of fiber cable (single mode, multimode, OM3, OM4,..) can be customized upon request. For information, Optech products are compatible with major switches and servers brands on the market. You can check all the compatible lists here. Optech offers a broad range of networking and communication solutions in following categories: Optical Transceivers, SFP, 10G SFP+, 25G SFP28, 40G QSFP+, 100G QSFP28, 400G QSFP-DD, Direct Attach Cables (DAC), Active Optical Cables (AOC), Ethernet Media Converter, Fiber Optical Patchcord, BWDM, CWDM, DWDM Mux/Demux and Repeater products. http://sintrontech.com/wp-content/uploads/2017/04/optech-logo.png 0 0 Optech http://sintrontech.com/wp-content/uploads/2017/04/optech-logo.png Optech2018-10-25 21:02:192018-12-06 20:59:07What is an Active Optical Cable (AOC) ?